Mercedes-Benz has been in the ascendancy in recent years. In the past its appetite for fleet business had been patchy, and, unlike BMW and Audi, it was seen as a brand that was more focused on retail sales. Even as recently as five years ago, Mercedes-Benz was a distant third in the premium car sales rankings in the UK, behind BMW and Audi. A new strategy emerged in 2010, and the brand has achieved significant growth since. With a target of overtaking both Audi and BMW, which looks increasingly likely as we approach the end of 2016, the business of driving growth in fleet now falls to Rob East. East became head of fleet for Mercedes-Benz passenger cars in July, having previously been national fleet sales manager. He joined parent company Daimler in 2009 and spent time at Smart and the Mercedes-Benz Driving Academy. In his previous role, he led a team of strategic account managers to record-breaking fleet sales in 2016, and now East is set to smash those records again as head of fleet. He does, however, ensure credit is given to his predecessors Nick Andrews and Sally Dennis for the brand’s huge improvement in performance in fleet and business sales. “Before 2010 we were very inconsistent in fleet,” he says. “Post-2011 our doors were opened for business with fleets, and we ensured we were easy to do business with, behaved with consistency, and began a great product assault. The introduction of new models, expanding growth across a broader base, has allowed Mercedes-Benz to maximise volume while limiting its impact on residual values forecasts, ensuring demand for new model lines would also be created among used car buyers. 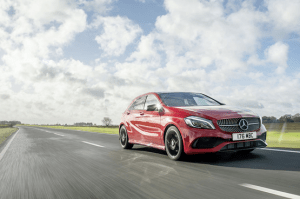 The revamped A-Class has much greater appeal than the previous generations, while the company has also added the CLA with four-door and ‘shooting brake’ estate versions, as well as the GLA crossover and B-Class using the same platform. A crossover based on the B-Class is also expected. But although Mercedes-Benz has had its sights set on becoming the number one premium brand, it hasn’t been checking out the opposition and crunching numbers on the hoof for short-term tactical gains.